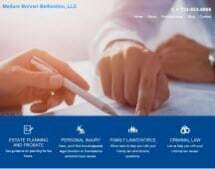 At the law firm of Medure Bonner Bellissimo, LLC, we are dedicated to helping people with all of life's important legal issues. Our goal is to meet the legal needs of individuals, families and small businesses throughout western Pennsylvania. Based in New Castle, we also have offices in Pittsburgh, Beaver and Ellwood City. Our attorneys make it a priority to build long-term relationships with our clients. Many return to us for help with new legal issues and refer their family and friends to us. As a local law firm, we find it rewarding to serve as the go-to legal resource for generations of people from all segments of the community. Our practice covers a wide range of areas, from small-business law to injury law, family law, criminal defense and more. We also handle complex class-action lawsuits involving dangerous products and consumer protection on a national scale. As a general practice firm, our lawyers have the flexibility, experience and knowledge to address your legal issue. You can expect to work directly with an attorney, receiving one-on-one guidance personalized to fit your needs. To get in touch with our legal team, please call 724-653-6906. We offer flexible appointment hours and competitive rates. For injury matters and class actions, your initial consultation is free, and you won't owe any attorney fees unless we're successful.